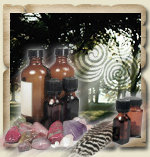 Wiccan Therapeutic Touch - Energetic session removing congestion in the aura, promoting healing, relaxation and well-being. Shamanic Healing - The Shamanic Practitioner journeys on your behalf to your healing spirits to obtain insight into life problems and offer solutions. There are many types of healing solutions available such as Soul Retrieval, finding a Power Animal, removing negative energy intrusions in the body and more. The healing is personal and based on the Shamanic belief that all illness starts at the level of the soul, so healing should start at the level of the soul also. Please contact us for more information. Spiritual Mentoring - For Solitary Wiccan practitoners. Free for Greenwood Tradition Members. End of life spiritual accompaniment- $60 per hour consultation. $35 per hour bed side vigil. Sliding scale available. Faery Healing- The Faery beings are always with us and they are committed to healing the world. They see humans as part of nature, even if we often forget that, and they consider that healing and helping a human is healing and helping the world. Please come and experience this wonderful and unusual healing that ripples out from you into the natural world for the good of all. Blessings of the Fay! Toucher Thérapeutique - séance énergétique qui aide a éliminer la congestion dans l'aura, promouvoir la guérison, la relaxation et le bien-être. La guérison chamanique - Les praticiens chamaniques voyagent en votre nom pour rencontrer vos esprits guérisseurs afin d’obtenir un aperçu des problèmes de la vie courante et pour vous offrir des solutions. Il existe plusieurs types de solutions de guérison disponibles tels que Recouvrement d’Âme, trouver un Animal de Pouvoir, retirer les intrusions d'énergie négative dans le corps, et plus encore. La guérison est personnelle et fondée sur la croyance chamanique que toute maladie commence au niveau de l'âme, de sorte que la guérison doit commencer au niveau de l'âme aussi. S'il vous plaît nous contacter pour plus d’informations. Service de Mentor spirituel Pour tous ceux pratiquant la Wicca solitaire. Gratuit pour les membres de la Tradition Greenwood.